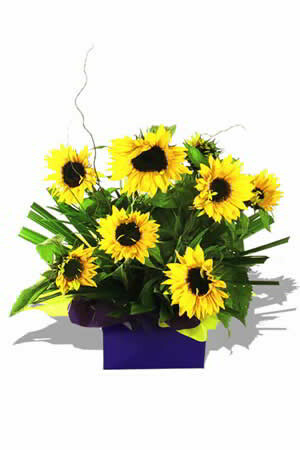 Bright and Stunning Sunflowers (or maybe yellow Gerberas, depending on availability) intermingled with Palm Leaf and Twisted Willow and green Small Foliage. This arrangement is certainly one way to make sure that your special someone is going to If you would like to make your flower gift extra special, we recommend you add a Box of Chocolates to your order. We have 3 to choose from; Standard, Premium, Superior. I was happy with the order but requested to change the cardwirding twice but had no response. Really really good I ordered at 1am and it was their by 2pm the same day and it was exactly what I was after thanks heaps! It was quite easy to order, the flowers were delivered promptly & looked beautiful. Thanks. As ordering from the UK it was a great efficient service and the flowers arrived the same day and we're lovely !